Peterbalds have an elegantly slim graceful and muscular build. They have a narrow and long head with a straight profile, almond-shaped eyes, wedge-shaped muzzle, and big set-apart ears. They have a long whip-like tail, webbed feet and oval paws that allow them to grasp objects and open levered doorknobs. They are somewhat similar in appearance to Oriental Shorthair cats. They have a hair-losing gene and can be born bald, flocked, velour, brush, or with a straight coat. Those born with hair, except the straight-coats, can lose their hair over time. 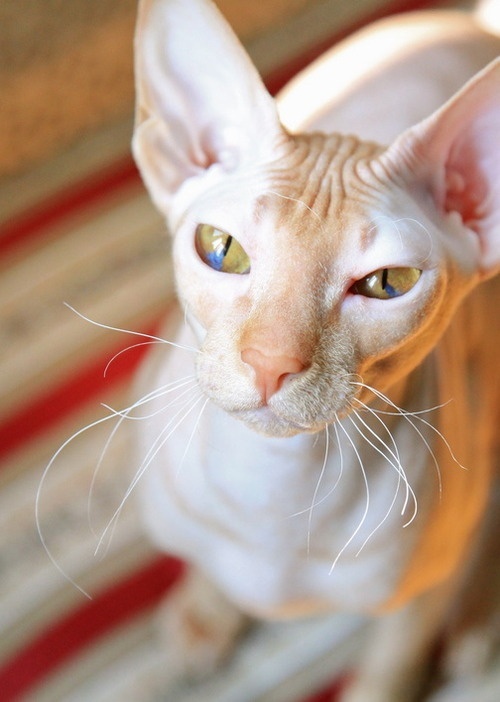 The Peterbald comes in all colors and markings. Recently developed in Russia, the Peterbald is an intelligent and playful breed with plenty of affection and enthusiasm to go around. Despite their name, not all Peterbalds are born hairless — some with hair, though, can lose it over time. These slim and graceful felines are quite rare across the globe.